Here you'll find an overview of how to successfully map fields into HubSpot. Please note, the list of all fields you can map is far greater, and can be found in the mappings step during your import. If you have any questions on a particular mapping, feel free to chat with us and we can walk you through it! 1. Owner is a lookup mapping, which means that it will look at the users that exist in your HubSpot account. You must have the owner setup prior, and have their identifying information in your CSV file (like email address, or name) which matches what is in HubSpot, in order for the mapping to work. 2. Company name is simply the text name of the company you add there. This is not a lookup (link) to a Company record in Hubspot. See #5 below for how to create the link. 3. Email is not required to import, but if you do map this field, it must be a valid email for HubSpot to accept it. HubSpot validates email addresses during the import, so any typos, etc. can cause the mapping to fail. 4. Lifecycle Stage is an example of a picklist field. You must have the same list of options setup in the field as those that exist in your CSV file in order for the mapping to work. The same logic applies for any other picklist fields you wish to map on the Contact record. 5. The associated company is an actual lookup (link) to a company record in your HubSpot database. You can map this field to link records during the import (even if email/domain don't match) as long as you have a column in your CSV to identify the company to link to. 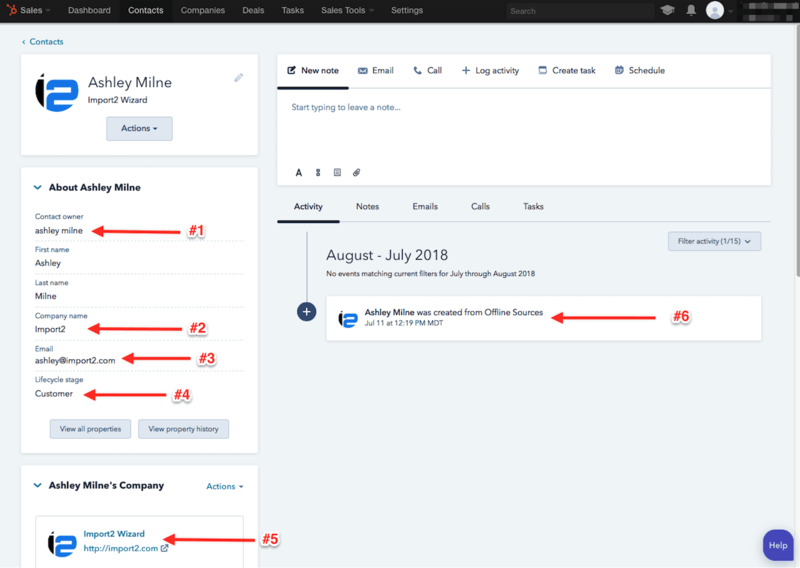 Any field on the company record can be used as the way to link - name, address, domain, or even a custom field of your choosing. 6. HubSpot assigns the create date when you import the record. This cannot be changed, and is not included in the list of available mappings.